Host university: City, University of London, School of Mathematics, Computer Science and Engineering. Industrial partner: BetterLife Innovations Ltd. Task: Design a lightweight mobility scooter for different target groups of users. BetterLife Innovation aims to be a facilitator of innovative thinking, merging customer requirements with the newest technology. Our starting point is an analysis of what the perfect customer solution looks like and then finding new, different or affordable ways to provide that solution. As new technologies and approaches emerge the potential for cross over between markets is greater than ever. However, with today’s emphasis on efficiency and immediate results, less time and resource is devoted to finding new ways of approaching product delivery – the old adage “if it ain’t broke, don’t fix it” seems to reign supreme. When combined with the reluctance of incumbent manufacturers to consider technology that is outside their current investment base, it is hardly surprising that there are few examples of learnings from one market being transferred to others. BetterLife Innovations’ objective is to try to harness new thinking and apply it to existing consumer needs with a particular emphasis on the elderly. The Mobility Scooter market is well established but not well researched; the best available data comes from a Research Institute for Consumer Affairs study conducted on behalf of the Department of Transport in 2014. Estimates indicate annual sales of around 100,000 mobility scooters, the majority of which are Class 2 scooters i.e. used on pavements (class 3 are used on roads and require DVLA registration). Within Class 2 scooters the majority sold are those designed to be carried in the boot of a car (57% of consumers owned a boot scooter) and the key consumer determinants for purchase are: that it fits into the car boot (89% of respondents), ease of lifting (53% of respondents) and price (36% of respondents). Products currently available on the market range from relatively low priced ‘cut downs’ of standard pavement scooters (e.g. the Airlite from Careco, see http://www.careco.co.uk/) to sophisticated designs specifically for the foldaway market (Moving Life’s ATTO https://movinglife.com and TGA Minimo https://www.tgamobility.co.uk being good examples). The weakness in all these products is that the claim of being light and easy to lift is not met by the reality. In lower cost models the scooter has to be broken into several parts to be stowed away and at best the unit has to be split in two and even then the lightest single part of any model available currently is 12kg. Design development may start from how the scooter looks like when ready for use or how it performs (its basic functionality should be a given) or may alternatively start from what the product looks like when folded down. This latter could be the key differentiator and determinate of consumer choice. The Company would like to develop a lightweight mobility scooter which could be used by different target groups of users, fold into the size that can fit in a car boot or in airplane/bus luggage and be as light as possible so that it can be easily carried by a single person. The company believe that design development may start from how the scooter looks like when ready for use or may alternatively start from what the product looks like when folded down. When closed the scooter should resemble a roll along suitcase and, ideally, be as easy to maneuver. When open for use the scooter must deliver the basic functionality of safely transporting the user in relative comfort but there is considerable flexibility in the look and style of the vehicle. It should be noted that over half of the current users of boot scooters are under 65 – this is not an ‘old person’ product and potential consumers may not only be open to more novel design, they may actually welcome it. Exploring the different design options for different users would be a useful process – potential users range from teenagers to octogenarians. Products currently on offer have improved considerably in the last 5 years with many manufacturers offering brighter, more colourful alternatives although all still retain the fairly clinical appearance of a mobility product. 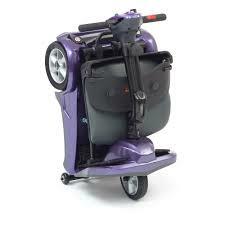 The company feel that a presentation and design more resembling a normal scooter may help destigmatise the product. The intention is that this initiative will be run in conjunction with exclusive sales and distribution partners in each market. Each partner will share the values of BetterLife and be prepared to invest the resource to ensure good market access and excellent after sale care. Direct to consumer via a dedicated Internet site. Direct advertising/sales via a Oaktree and their team of 40 national sales people. Through selected retail outlets led by Middleton Mobility, Oaktree’s retail arm. The creativity of design required to deliver something small enough to be easily transported (about the size of a pull along suitcase) but capable of folding out to provide stable transport for an adult weighing up to 120kg. The material of construction, which will need to be strong but light if it is to deliver a below 10kg weight; CFRP looks promising but there are many other options. The power unit – battery technology has moved on significantly in recent years and the necessary power can already be delivered by a battery of 3kg or less. To bring the whole unit in at £500 or less. The proposed solution shall be SMART – Specific to the requirements for lightweight mobility scooters, Measurable by surveys of user experience, Action-oriented well-defined steps of a clear project plan, Repeatable for variety of customer target groups and applications and Timely fitting the available timeframe. BetterLife Innovations will be fully committed in this project with regular design reviews and guiding of students. Reviews will be held with key BetterLife personnel and representatives from Oaktree (who will provide insight to the needs of the end user), together with technical specialists as required. At the end of the project, it is envisaged that full sized prototype(s) will be fabricated which will be audience-user tested and all functionalities could be fully evaluated. The manufacturing of prototypes will be supervised by the City, University of London staff and realised jointly by the University and BetterLife; BetterLife will facilitate the sourcing of components needed for prototype construction. The final workshop will be held at City. Engage in a true cross-collaboration multidisciplinary process that includes industrial design students, mechanical, electrical, electronic and other students. Develop awareness of requirements for lightweight mobility scooters which allow users experience of security, safety and ease of use. The Company expects the Virtual Enterprise of NARIP to commit fully to the project and requests timely and active communication and collaboration, which will allow to gain new knowledge and novel insights for all and result in innovative, trend changing designs to lead the Company to successful new products.